DeepMarkit Corp., ("DeepMarkit" or the "Company") (TSX VENTURE:MKT), is very pleased to announce the release of its new Space Commander game on the FetchBot Social platform. FetchBot Social brings casual and social games in HTML5 to messaging apps, social media platforms and other online environments. 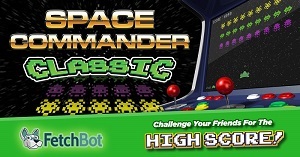 FetchBot's Space Commander brings back all the excitement of retro arcade games with a new take and new name for a favorite game that everyone will remember and enjoy. Enjoy the classic graphics, but now from the comfort of your computer, tablet or phone. Shoot down your alien enemies and survive as long as possible to get the best score. Then, share the game with your friends and challenge them to beat you. 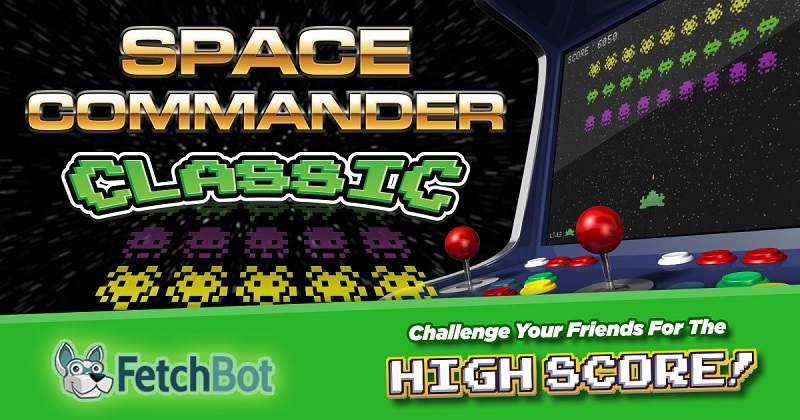 Unleash your Space Commander challenge on fetchbot.com. From a messaging app, social media service or any website, people can challenge friends to compete for the Space Commander high score and watch their status on constantly updated leaderboards. FetchBot Social games leverage HTML5 technology so they can be distributed and played on any device and on any of the popular social media sites. DeepMarkit provides a full turnkey social gaming solution to any business from full creative development to system integration and complete administration of the gaming environment. FetchBot Social supports the creation of customized, branded games with corporate logos, text, an array of animated characters, a palette of design themes, and redeemable rewards. In order to fund the continued development and the marketing launch of FetchBot Social, DeepMarkit announces a non-brokered private placement of up to $1,147,500 (the "Private Placement"). Under the Private Placement, which is subject to acceptance by the TSX Venture Exchange, DeepMarkit intends to issue, pursuant to applicable exemptions from prospectus requirements of Canadian and United States securities laws, 13,500,000 Units (the "Units") at a price of CAD $0.085 per Unit. Each Unit comprises one common share and one common share purchase warrant (each a "Warrant"). Each Warrant entitles the holder to purchase one additional common share of DeepMarkit at an exercise price of CAD $0.15 for a period of twelve (12) months from the date of issuance of the Units. DeepMarkit may pay a finder's fee of up to 8% in cash to eligible finders in connection with the issue and sale of any or all of the Units under the Private Placement. The net proceeds from the Private Placement will be used to fund further development and the marketing launch of FetchBot Social. DeepMarkit also announces the grant of 500,000 options to a director of the Company. The options have an exercise price of $0.15 per share, a five year term and are fully vested. DeepMarkit is a gamification technology company inventing new ways to engage consumers and other audiences. FetchBot™, the Company's proprietary promotions platform, enables businesses and agencies to create branded videogames that incentivize consumers, thus driving sales, capturing data and generating leads. FetchBot integrates next-gen gamification engagement mechanics with interactive advertising industry standards to offer marketers an advanced solution suitable for campaigns of all sizes, targeting multiple channels on the web, mobile and social media. FetchBot Social is DeepMarkit's suite of HTML5 games and gaming solutions for social media, messaging apps and other online community services. FetchBot Social instant games can be added to any online environment to encourage usage by providing a fun way to engage audiences with competitive or collaborative games. FetchBot Social provides numerous options to monetize through custom branded games, product placement, corporate sponsorships and prize and incentive awards. DeepMarkit's shares are listed on the TSX Venture Exchange, trading under the symbol MKT. For additional information, please visit www.deepmarkit.com. Statements in this press release may contain forward-looking information including, statements regarding the launch of the FetchBot Social platform, the potential for any commercial relationships and the intention to complete the Private Placement. Any statements that are contained in this press release that are not statements of historical fact may be deemed to be forward-looking statements. The reader is cautioned that assumptions used in the preparation of any forward-looking information may prove to be incorrect. Events or circumstances may cause actual results to differ materially from those predicted, as a result of numerous known and unknown risks, uncertainties, and other factors, many of which are beyond the control of DeepMarkit. Factors that could cause the actual results to differ materially from those in forward-looking statements include, failure to conclude binding agreements with re-sellers, failure to obtain market acceptance of the Company's products, inability to complete further development of the product or business, the failure to raise required capital under the Private Placement, and general economic, market or business conditions. The reader is cautioned not to place undue reliance on any forward-looking information. About this company DeepMarkit Corp.